Bo Van Pelt (-6) leads eight others including former FedEx Champ Jim Furyk after the first round at The Barclays. The main story in golf the last month has been the dominance of Rory McIlroy (three straight wins) and Rickie Fowler (two 2nds in majors), and what their success at a young age means to the future of golf. Rory struggled across the board Thursday – breaking a streak of fourteen straight above-average rounds dating back to early July – while Rickie delivered another solid round to end up three off the lead. Most notable from Thursday was the continued great play of Jim Furyk; he’s racked up three top tens and a T15 in the last month behind great iron play and a hot putter. Ridgewood was set-up at an average length Thursday and yielded fairly normal course stats in terms of accuracy (64%), GIR (67%), and scoring (70.8 on a par of 71). Where it’s really difficult is from the rough. It was in the upper tier of PGA Tour courses in terms of difficulty. The par 5s also play mostly as three shot holes; the pros only went for the green in two 17% of the time (average of 50%) and hit the green in two 2% of the time (average 14%). The 5th is a drivable par 4, playing 283 yards on Thursday, that is one of the best examples of a drivable par 4 all season. If you take a look below you’ll see the elevated green is narrow and tiny, measuring 9 yards wide and only 2200 square feet (microscopic by PGA Tour standards). The green is surrounded by bunkers to dissuade some from attacking it off the tee; lay-ups are made to around 85 yards. Driving the green requires a carry of around 270 yards, 40 feet uphill, and is best done with a right-handed fade. 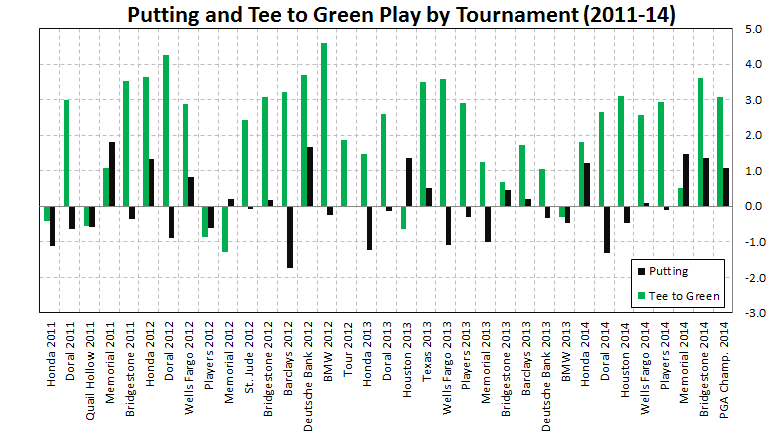 Just over half the field went for the green off the tee, scoring about 0.1 stroke better than those who laid-up. Because of the carry required, none of the shortest hitters who went for the green hit it or made birdie. Because there isn’t a ton of difference between the expected values of each strategy, the shorter hitters and anyone who’s really good with a wedge from 100 yards in should probably lay-up. Anyone with average or better distance should absolutely take-on the green though. Average or longer hitters who went for the green scored at 3.60, everyone else at 3.91. The real pay-off isn’t really being close to the green – a 25 yard bunker shot isn’t much easier than a 75 yarder from the fairway – it’s instead in actually hitting the green. All five who hit the green made birdie, which is expected when the longest possible putt you can face is 50 feet. You can see the distribution by score below. With Rory’s run of success every poor round is apt to be magnified beyond proportions. Even great players play poorly some days. Rory’s expected to have a round as bad as Thursday’s only around once every 25 rounds, so this is likely as poor as we’re apt to see him play for awhile. What’s important isn’t really this round, but how he’s had success so far this year. Rory emerged as a star and won his first two majors in 2011 and 2012 while being wholly dependent on his driver/irons for success. He was the best in the world on those long shots in 2011-12, while his putting was average or a bit worse. Last year, his driving was wild and he lost a lot his long game that had made him great. This year, the driving is as good as ever and his irons are great, but what’s really different is his success with the putter. He’s jumped to 21st on Tour in putting, gaining about half a stroke from putting compared to the last few seasons. Over this latest run of wins his putter has been nuclear hot (+1.20 strokes vs. the field). That’s been enough to take him from one of a group of 3-4 elite players to the best in the world. The problem is putting is hugely random. Players putt well above their talent level for months and then regress. Up until July, McIlroy had putted at +0.16 strokes gained for the season and slightly below average for his career. Since then he’s at +1.20 strokes gained. This post deals with the small sample randomness involved with putting; nothing McIlroy is doing on the greens indicates to me that he’s going to sustain the level of putting that won him two majors in the last month. When his putting returns to his career norms, he’ll still be the best player in the world, but as more of a 1A to Sergio, Adam Scott, and Justin Rose than the next Tiger/Jack that he’s been made out as the last few weeks. His long game (driving/approach shots) is the best in the world largely because he’s in another universe off the tee. When Tiger was dominant for a decade he combined the best long game in the world with top ten putting; nothing Rory has done shows that he’s capable of putting that well for the long haul. McIlroy’s Strokes Gained per Shot Link tournament since 2011. His putting surge in the last few months is obvious. Much of the previous section applies to Rickie Fowler as well. Fowler took on a highly publicized swing change with Butch Harmon at the beginning of the season which left his game a mess for months, but which looks great now. His tee to green game has been the best of his career the last two months – a testament to the work he put in with Butch earlier this season. However, what’s really fueled him to four straight top tens in major tournaments has been a ridiculous run of putting. He’s putting about a stroke better per round than he ever has since June. He’s a solid putter in his career, but he’ll look mortal when this hot streak ends. Today’s round is a good example; his very good long game was erratic and his short game was awful. What saved him was gaining 4.5 putts on the field including two 13′ and two 11′ putts to save par after missing greens. You look real good when you hit all four of those, but most of the time you hit only 1-2. That’s why Rickie’s sitting on a -3 instead of a -1. The PGA Tour chose Bo Van Pelt’s eagle chip-in on #17. You can see on the video that it was a long chip (48 feet), but from right off the green. It ranked 6th among non-putts in terms of strokes gained (+1.3 strokes). My highest ranked shot was Chris Stroud’s 20 yard hole-out from the bunker on the 7th (+1.5 strokes), for which there is no video available. Andrew Svoboda’s drive onto the the green 30 feet away at the drivable 5th hole was the best tee or approach shot of the day (+1.2 strokes), setting up a two putt birdie.